We have lost a giant. Sylvia Thalman, co-founder of MAPOM and active board member since the 1970s, died in January. Yesterday, a large throng of family, friends, Native Americans, and admirers gathered at Tiburon’s Corinthian Yacht Club to celebrate her life. Back in the 1960s, long before there was any public interest in Native America, Sylvia worked with other non-Indians in Marin to learn the history of the Coast Miwoks who once were the guardians of the land that is now Marin and southern Sonoma Counties. 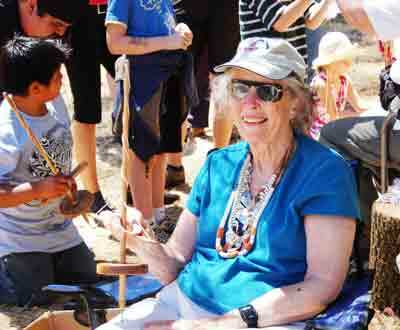 She was a co-founder of the Miwok Archeological Preserve of Marin (MAPOM) and was active as a director until her stroke last year. In the 1970s, she and others in MAPOM worked with the National Park Service to create Kule Loklo, intended to honor the Coast Miwoks, who at the time were thought by non-Indians to be an extinct people. She also quietly worked at researching the genealogy of the Coast Miwoks, meticulously combing through Mission, genealogy, and public records. At yesterday’s service, Greg Sarris, chairman of the Federated Indians of Graton Rancheria (Coast Miwoks), spoke of when his people were trying to regain the Federal tribal recognition that had been taken from them decades earlier, they found that Sylvia’s quiet but dedicated research provided them the documentation they needed to regain Federal tribal recognition. In honor of Sylvia’s work, the tribe made her an honorary elder, and she was awarded the Bay Area’s Jefferson Award for public servce. Julia and Lucy Parker, who’ve long taught MAPOM basketmaking classes at Kule Loklo, sang two Yosemite Miwok songs with Lucy’s son and spoke of their long friendship with Sylvia. Other speakers included MAPOM president Ralph Shanks and his wife Lisa, John Golda of the National Park Service, Pat Rapp, and members of Sylvia’s family. No one can ever replace Sylvia, but the work she began continues in the activities of MAPOM, in Kule Loklo, in the Indian Skills classes that MAPOM has long offered, and most importantly, in the victory of the Coast Miwok people in regaining their tribal recognition. Sylvia, we’ll miss you forever.